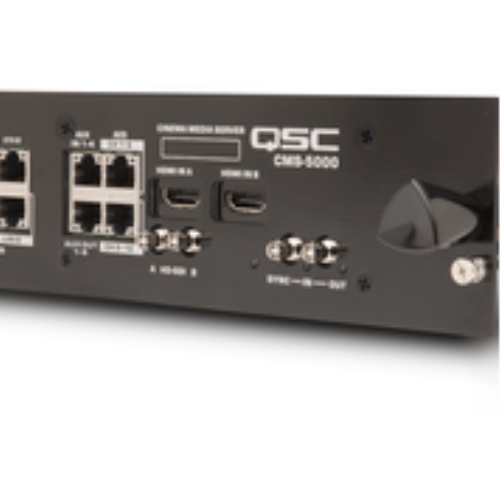 QSC , a leading global manufacturer, expands its comprehensive catalog of cinema solutions by introducing the next-generation cinema media server, the innovative CMS-5000. The CMS-5000 combines the functions of a full-featured media server while bringing new capabilities to the category including exceptionally fast DCP ingest and seamless integration with Q-SYS™, an integrated sound, picture, and control platform for the networked digital cinema complex. The CMS-5000 features include two terabytes of reliable onboard solid-state storage, dual HDMI 2.0 ports for alternate content, and a 10Gb Ethernet port for exceptionally fast DCP ingest of content and live streaming ¬– up to 10 times faster than other servers. Operating at typical ingest speeds of 80 MB per second, the 10Gb Ethernet port allows full-length motion picture DCP ingest in the time it takes to play a trailer. Management options include powerful browser based management directly from the CMS-5000 or further customized via Q-SYS to give users full control of content, playback, scheduling and configuration from a smartphone, tablet or computer, maximizing flexibility and convenience. The CMS-5000 is capable of JPEG 2000 DCI content playback of 4K 2D up to 60 frames per second, and 4K 3D up to 30 frames per second and supports several immersive audio formats. The CMS-5000 sets a new standard for cinema media server performance, functionality and ease of use with availability expected fall of 2018.